I sort of don't have much time right now, but I'll try to write a little about last night since it was pretty cool. I ended up leaving for Ebisu a little later than planned, so there wasn't any time to pick up any food or drink on the way. Then, at liquidroom, they were late in giving us our tickets. I had promised to meet Mariko at the station at 4.30 to show her the way to the livehouse, and we didn't get our tickets until 5 minutes before that, so things got a little rushed. After this short but awsome MALICE MIZER performance, Seth did a solo, and then session bands with K and Hayato. Moi dix Mois have been doing so few lives that it feels almost weird to see Seth being a part of it....<_< I've become so used to seeing him at Art Cube's lives instead. It also sounded like there were more people screaming his name than Mana's this time. 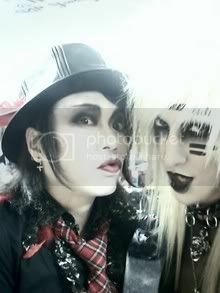 Közi did some of his solo stuff, and the drummer was Chargeee from PPP (he's pretty easy to recognize). Everyone seemed very happy that he did Honey Vanity :D The last half of the live was Moi dix Mois playing about 10 of their old songs, and a couple of new ones. After all of this, a group of about 12 of us went out for dinner at a restaurant nearby. That was nice ^^ A couple of girls had travelled all the way from Osaka for the live, and had to take the overnight bus to get back home. They also travelled to Europe to see M10M's tour there. And I really don't see why we're always taking pictures after lives D: Especially after spending a few hours in the front at a M10M live. And thanks a bunch for the report! Aw I was hoping they would make some kind of announcement or something >< It's awesome that they played MM though. I really wish I could have been there. Yeah, no announcement :/ But N.p.s N.g.s totally made up for whatever else might have been missing. Hearing old MM's songs plus seeing both Mana and Kozi on the same stage must be a blissful experience.XD That's so cool, too bad that they didn't invited Yu~ki. 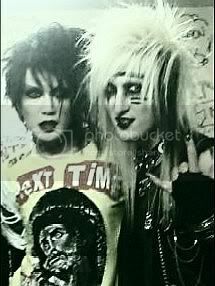 I was so happy for my friend that Mana and Közi did a couple of MM songs together. She can't take many days off from work, but managed to get Saturday available for the live even though she doesn't follow any of their solo projects. Besides, Charge, do you know if Jiro was playing for kozi? and the bassist was Kenzi? I'm pretty sure Jiro was the guitarist, but I'm not sure about Kenzi, sorry >_<. 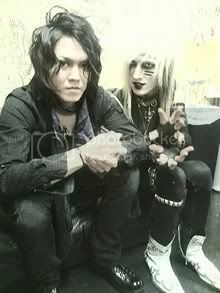 I've found pics at charge's blog of Kozi's support band. "He drank something from a bottle and spit it back out at us. Moitie clad fans in the first few rows did not appreciate that>_<"
:O!! i didn't hear about this! i guess these people might have been quite pissed at kozi XD thanks for telling me this! Hi, it's Geisha. It was really nice to meet you again in Tokyo. I hope you don't mind that I added you on LJ. Will you add me back? hahaha, no Jack Daniels in my Moitié.